And finally, there is the networking aspect of it. Private college counseling is an isolating profession and it would be nice to connect to others with similar interests. Hmmm, my reasons aren’t so different than why people decide to go to college. As I started researching online college counseling certificate options, I found that there are two types of certificates. The first is essentially a continuing education program being offered by a university. These certificates generally require the student to have already completed an undergraduate degree. The courses are taken outside the university’s normal class schedule. Nor will they count as college credit to a specific degree. Ok, I can’t help myself. Given that these courses are designed to educate professionals who will help students get admitted into highly structured, accredited programs with stiff requirements for faculty, it’s just a little bit ironic. Don’t get me wrong, I’m researching these programs because I’m considering enrolling in one. But these represent two, shall we say, diverging approaches to education. This is higher education today. The second type of certificate is based on a selection of existing graduate courses that a student may take to complete the certificate. In this case, the student can apply the courses they’ve already taken towards the completion of a master’s degree. My gut feel is that between the two, the former will be more useful for those planning on setting up a consulting business. My rational is that the courses are designed to meet the specific needs of the students in terms of needed information, time availability, and costs. The carved out graduate certificates seem to me an attempt to meet the institution’s need for more students in their already existing courses. However, for those who are working as high school counselors or admission officers, this might be a better approach. Being able to apply credits to a future graduate degree in an education related field might have significant benefits for future promotions or pay raises. I’ve included Hamline University’s program in my listing below. North Carolina State University also has an online program but I didn’t include it in my listing. Columbia University also offers an Advanced Certificate in College Advising. These programs seem more oriented for those interested in a more academic approach to college counseling and that’s not my purpose here. Of course, I could be completely wrong since I haven’t actually taken any courses yet. So let me get to what I’ve found so far. Let’s start with the actual certificates. The first table is just a summary of the major programs I’ve found so far. The Rice program definitely lags behind the others in terms of online information availability. I get the impression that it’s a program transitioning from separate continuing education courses to a comprehensive certificate. And at least one of the courses states that you have to show up for at least one in person session which probably won’t work for anyone living outside of Houston. UC Berkeley offers a college counseling certificate but it is in-person only. As you can see, Hamline And UC San Diego offer the shortest path to a certificate with UC San Diego being the cheapest. It looks like the UC San Diego Certificate is geared to get a student started quickly and allow them to take other courses as needed. UCLA also offers an abbreviated form of its certificate that requires only 3 courses and 1 elective. One thing to watch out for is discounts offered based on HECA or IECA membership. More on the professional organizations in another post. You can see the courses available in the table below. I wanted to be able to compare course offering so I’ve added some color coding. Bold, red text indicates required courses. I tried to have those all listed at the top. However, I also wanted to be able to identify which courses were common across all of the programs. So I added colored backgrounds to rows with common courses. There’s really nothing significant about the colors, I just needed different shades for the different type of courses. The “Sort” column just allows you to reset the table to the original order after sorting. After going through this process, it’s obvious that UC Irvine has a strong focus on college counseling for IECs. I’m sure there are people out there who are thinking, “well of course, it was designed by x, y, and z who are leaders in IEC development.” Just remember, that’s not the background I’m coming from. I’m still figuring all of this out. With the exception of Rice, all offer, and the UC’s require, a practicum in College Counseling. Some sort of financial aid course is required for all programs except for Hamline. 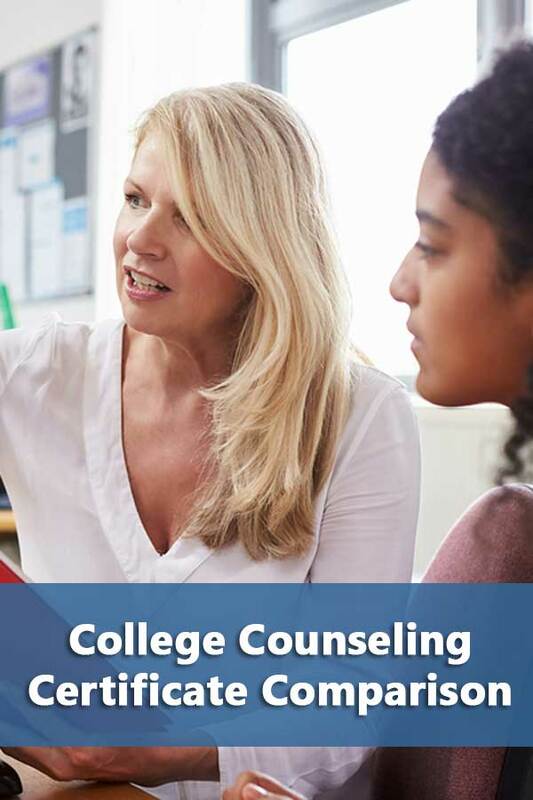 All of the College Counseling certificates except for UC Irvine require courses related to principles of college counseling and college admissions. I think these concepts are covered in two other required classes for the UC Irvine program. However, I didn’t include them since I think the focus is significantly different enough that they should stand by themselves. Four of the programs require courses related to career counseling and three offer courses at business development. You can find electives in college counseling for international students at three of the programs. Only one program, UC Riverside, offers and actually requires a course on ethical issues for its College Counseling Certificate. Of course, as I mentioned in the beginning, classes and subject material aren’t the only reasons to select a program. Two related reasons are for the actual credential and networking opportunities. The credential can help in developing your business. Regardless of how valuable you actually find the program, there will be families that will feel reassured by the presence of a college counseling certificate. Is there enough name recognition outside of college admissions professionals for the specific program to make a difference? I sincerely hope not. The certificate can also help you meet the requirements for membership to a professional organization. They essentially substitute for experience for HECA and IECA membership. HECA will only accept certificates from certain programs which is one way of narrowing your choices. As for the networking aspect, I think a lot of this will still ultimately depend on the student. UCLA may have the oldest program and subsequently the largest alumni network, but it’s really on the student to make use of it. And how much of that networking can also take place through professional organizations? Hey, again, an interesting parallel to students selecting undergraduate programs. There’s a third way of acquiring the necessary information and skills for college counseling outside of an institution of higher education. All three of the major professional organizations associated with college counseling offer annual conferences with valuable information sessions. NACAC and IECA provide continuing education credit which can be an added incentive for those in jobs or professions that require CE credits. Besides its conference, IECA offers an in-person summer training institute that lasts a week. While I’m sure all of these organizations offer valuable information through their conferences, this strikes me more of a hit or miss type proposition in terms of establishing a foundation for your practice. I could see this being a viable, faster, and potentially much cheaper option for those coming directly out of a high school counseling or college admissions position.